DirectionalEQ does what it claims to and works really well as both a corrective tool and a creative effect. A good idea well implemented. Flexible filter options. Very affordable. Can be used as a panner. Capable of spreading mono sounds. Uninspired graphics. Needs a mix control for creative use. DDMF impressed us with its very accurate Neve Portico-inspired 6144 EQ, but its other releases (including two excellent graph-based EQs) indicate a leaning towards more cutting-edge development. Its latest plugin, DirectionalEQ (VST/AU/RTAS), is a perfect example of this. As the name implies, DirectionalEQ combines EQ and panning, the aim being to modify the frequencies of specific parts of the stereo image. It has five parametric bands, each with the same set of controls. From the top down: EQ Gain, Frequency, Filter Q, Degree, Filter Type and Directional Gain, plus Mute and Solo. "The filter types on offer comprise band-pass (two types), notch, low-/high-pass, low-shelf, high-shelf and peak"
The filter types on offer comprise band-pass (two types), notch, low-/high-pass, low-shelf, high-shelf and peak. EQ Gain (+/-20dB) and Q apply to the shelf and peak types, and all bands' frequencies are fully sweepable from 16Hz to 22kHz. Directional settings are made using the Degree control (-45 to +45 degrees). In addition to the traditional EQ Gain knob, there's also a Directional Gain knob that controls overall gain in the direction set by the Degree control, and once again it gives up to +/-20dB of boost/attenuation. The first thing to get to grips with when using DirectionalEQ is the red Directional Gain knob. Even with your EQ settings flat, this can have quite a dramatic effect on the stereo balance, combining with the Degree setting to form a very flexible pan control. "Obviously, with five bands in play, it's important to keep a clear head"
Obviously, with five bands in play, it's important to keep a clear head. Next up, the filter shapes influence how you work. With all options available across all bands - and frustratingly, no graphical feedback - it's imperative that you really think about what you're doing. Not surprisingly, we found ourselves calling on the individual band mutes and solos a lot. We started by testing DirectionalEQ on a range of stereo sources - such as sampled strings - using the regular filters to boost and cut specific frequencies at specific points in the stereo image. The results were very impressive - we could boost the brightness quite heavily where we wanted to without affecting everything else, and a knock-on benefit is that the overall result doesn't sound over-EQ'ed. Staying with stereo material, we moved on to some submixes and full mixes. With multichannel material like this, there are various clever things you can do with DirectionalEQ, such as adjusting the overall width of the image by altering the central level, or shifting the image by using Degree offset gains. Also, by EQing a centrally panned band (effectively a mono signal) you can boost or cut vocals and other 'centred' material. Finally, we had a go at enhancing mono signals. Working on an acoustic guitar part, we were able to enhance different parts of the stereo image pretty accurately, creating artificial width by spreading low frequencies towards one side and higher ones towards the other. 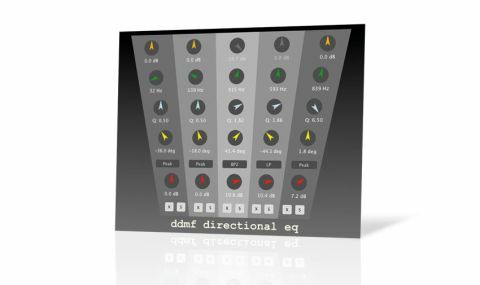 Directional EQ wears its two hats - correctional and creative - well, and although the graphics are rather uninspired, it's certainly easy to understand and use. Sure, there are other ways to do the things it does, but not in such a simple or affordable package.